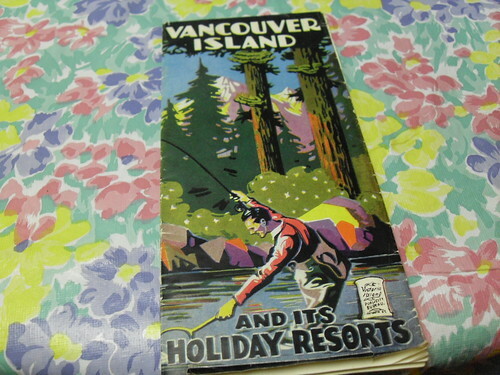 I bet if I took an afternoon to dig through the garage or storage room at my mom’s house, I’d probably turn up some buried treasures from across Vancouver Island that my Opa collected years ago. It’s something I’ll probably never actually get around to, but thankfully Raymi did some of it for me. Who knew Vancouver Island was so big in Ontario? 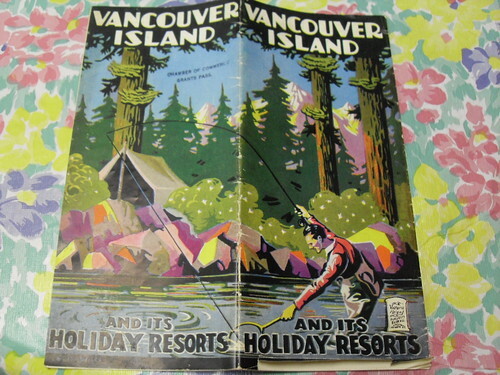 She recently snapped these photos of a very, very old pamphlet belonging to Dave that was published by the Victoria and Island Publicity Bureau. As far as I know, that entity operated out of the south Island between the 1920s and the 1960s, so that will give you an idea of just how old this is. Someone correct me if I’m wrong on those dates. 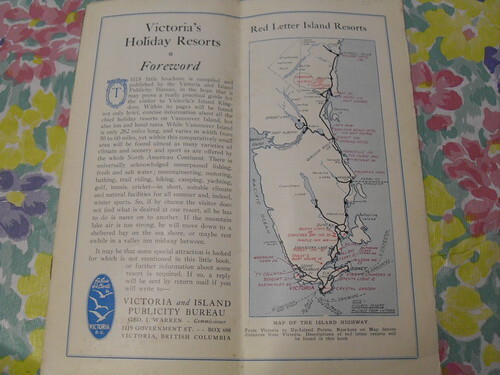 If you click this last photo to view the original size, you can clearly see that the highway connecting the eastern Island to Tofino and Ucluelet was non-existent at the time of publication. I suddenly have the urge to hike at Mt. Beecher. i’m running for mayor of victoria. Nice find! This is too cool! FYI, “Ty Collwyn” and Woodside Farm are still in operation today in Sooke. It also appears that the Hwy 14 to Port Renfrew north/west of Jordan River was either just a trail, logging road or something. Come to think of it, it’s still kinda rough. this is awesome, I don’t know what the tourist propaganda looks like these days but for some reason the look/feel of this old stuff makes it feel more human.